As we enter October is to time for a change and we’ve got some great products to enjoy as the days get cooler and evening draw in. In this blog we tell you all about our lunchtime soups, winter warmer hot juices, new products from Pukka and a great new autumn themed juice. There’s lots going on this week so make sure you read to the end! Warm yourself up this autumn with a Winter Warmer, hot juice. These are unique to Barannes and were a great favourite last year - in fact they are so good some of our customers have continued to drink these through the summer too! Made with some of our fresh juice ingredients and specially selected spices, we’ve come up with four great tasting combinations to suit all palettes. A range of four superfood latte blends for a convenient, indulgent and delicious way to enjoy herbal benefits from the wonderful people at Pukka Herbs. All have no added sugar and are caffeine free. Just add hot milk (preferably non-dairy or organic!) and enjoy. 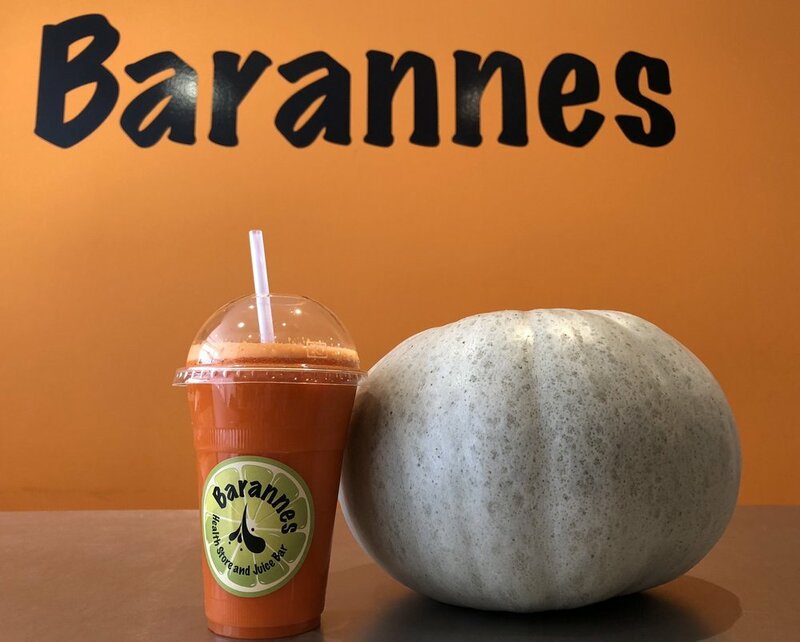 We are ending this post with a lovely autumn themed juice created by the ladies at our Colomberie shop. Preparing for Halloween we are seeing lots of pumpkins around at the moment so we just had to try some pumpkin creations. Our spiced Pumpkin special will be on sale in both shops during October and is made from: Pumpkin, Apple, Lemon, Carrot, Cinnamon & Cayenne Pepper. We hope you love it as much as we do! If you are wondering if there is a problem with the colours on your computer, don’t worry this is a Blue Pumpkin! Better for juicing than the normal orange variety, it has bright orange flesh and is rich in beta-carotene which is converted by the human body into vitamin A.